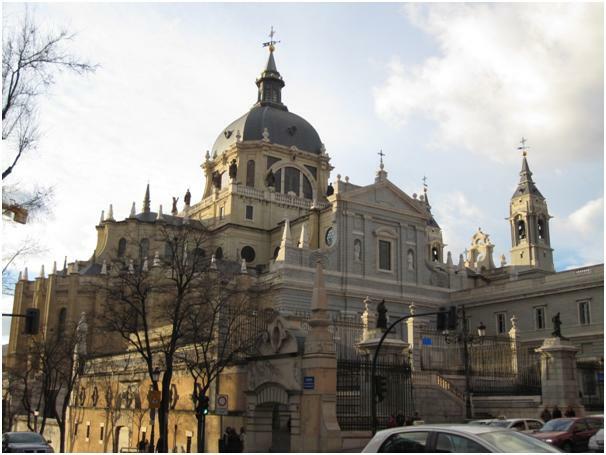 Alice Power, first year student on the BA (hons) Museum and Heritage Studies degree pathway, completes the short series of blog posts resulting from a recent study trip to Madrid by examining the distinctive traditions of Spanish Catholic art. Fig 1. An interior arch in Almudena cathedral, Madrid. Amy Lou Bishop. 13 February 2013. As we stood outside the Almudena Cathedral in the heart of Madrid, I turned to my student colleagues and set them a challenge, asking: ‘How old do you think this building is?’ Here was a chance to put into practice what we’ve been learning in our first year History and of Art and Design lectures by looking at a building of which none of us had prior knowledge. The four of us looked carefully at the decoration that adorned the ornate exterior. It didn’t seem to fit clearly into any style or movement that we were familiar with. There were certainly Baroque influences, which complimented the neighbouring Palace nicely, but as a whole it looked too fresh to be from that period. Our collective brain power estimated that it probably dated from circa 1875. We weren’t far wrong. Construction started in 1879. However, due to despites over decor and the turbulent political conditions in Spain during the twentieth century, it wasn’t completed and consecrated until 1993. Fig. 2. Exterior of Almudena catherdral taken from Calle Mayor , Madrid. Amy Lou Bishop. 13 February 2013. The interior was, somewhat unexpectedly, neo-gothic in style. Nevertheless, the bright whiteness of this still-young building gave it a very different atmosphere to the countless neo-gothic churches I’ve visited in the UK, Ireland and France. The ceiling decoration was very fluid and modern, marked with the bright colours that one often associates with Spanish imagery. We visited on Ash Wednesday, so the space was active with worshippers as well as tourists. Despite this, the space felt somehow bare. Due to its age, it isn’t cluttered with tombs and monuments. One of my fellow students mentioned that it felt more like an art gallery than a place of worship. 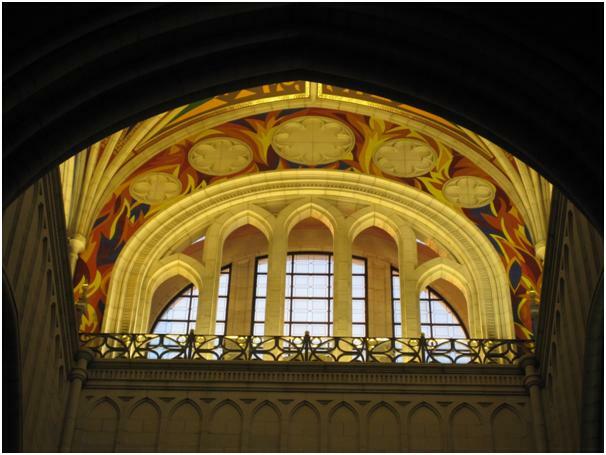 With little uniformity in the scale and style of art displayed in each chapel, it was easy to view them as exhibits. As I had been educated in Catholic school, I’m fairly familiar with what each of the religious signs are meant to indicate, but here things weren’t so typical. Christian art, as a category, is vast and ever changing, yet within Catholicism, traditional styles and forms usually dominate. Two years ago I visited a church called Parroquia Nuestra Señora de la Encarnación in Marbella. It was situated down a rather unassuming alleyway in the old quarter of the town. I found the style of the interior, however, to be completely overwhelming. Many of the statues were life-size, draped in velvet robes and featured real hair. Each one was richly decorated with gold. They were extreme examples of what I’d anticipated. The iconic, highly decorative images of Catholic saints produced in Spain and other Hispanic countries are globally recognised as distinct to their cultures. Hispanic-style images of the Virgin Mary are a staple of any tattooist’s repertoire and are also often recreated in kitsch novelty items. Examining the chapel of Ave Maria Purisima sin Pecado Concebida in Madrid’s Almudena Cathedral, however, challenged all my preconceived ideas about Catholic art in Spain. The chapel was focused on an oil painting of the Madonna. Instead of highlighting her holiness by covering her in regalia, this Madonna was depicted in white with her head exposed, carrying a light. The most striking aspect to me was how clearly youthful she was. The gospels say that Mary was in her early teens at the birth of Christ, yet in most of the art created in her image she is more like a doll than a child. The painting did exactly what religious art is supposed to do. It made me think. Although I’d heard the gospel passages countless times, I don’t think I’d really ever connected the stories to the condition of a modern day young mother. Above the painting was a stained glass window made up of strikingly modern angular shapes. This is something I’d often seen in Protestant churches, but never in a Catholic cathedral. In many Western cultures, the presence of a cathedral is still an unofficial sign of city status. Yet, for centuries, Spain’s capital lacked an operational Catholic cathedral. As an outsider I found this peculiar. I’d always assumed that there was something almost innately Catholic about Spanish national culture. In reality, Spain’s religious identity is a result of a long standing power struggle between Jewish, Islamic, Protestant and Catholic traditions, as well as the amalgamation of many strong regional identities. Nonetheless, 92% of people living in Spain consider themselves Catholic although many infrequently attend church. In some regions, parishes broadcast masses on local television networks. Perhaps this explains the diversity of the art in their churches. While in the UK, we’re predominantly interested in preserving the past, in Spain religion is much more connected to the present. Not long after I returned from Madrid, a news story about a Catalan church that commissioned local graffiti artist to paint its dome was widely reported: www.bbc.co.uk/news/magazine-21529832. This shows that modernising trends are evident in churches all over Spain. Ultimately, Madrid’s Almudena cathedral is not just a place of worship and tradition. It is a boast that Catholicism survived attempts by other faiths to become dominant. As a site that incorporates elements of the past and the present, as well as local and universal iconography, it’s also a showcase for the diversity of Spanish national history and culture. Karen Scanlon, a first year BA (hons) Fashion and Dress History student, continues a short series of blog posts on hispanic material culture by examining Spanish dress, past and present, at Madrid’s Museo del Traje. As part of a recent study trip to Madrid, I made a visit to the city’s fashion museum. Although not as conveniently located within the centre as most of the other museums, this shouldn’t put anyone off from visiting, as a short underground journey from the city centre to Moncloa station will get you there. The city’s clothing collection began with an exhibition called ‘Regional and Historical Costume’ in 1925, held in the Palace of the Library and National Museums of Madrid. By 1934, this exhibition had merged with the Museum of the Spanish People and was arranged by the government of the Second Republic in the hope of creating a display that would reflect different Spanish traditions. The museum was open on and off between 1940-44 and again between 1971 -73. From then, the collection went into storage until 1987 when it was moved to its current location and site of the Spanish Museum of Contemporary Art (MEAC) with a plan to reopen the collection to the public. Museo del Traje started as a project that would bring traditional, historical and contemporary fashions together as a site for reference and research. Having never been to Spain before, my knowledge of Spanish dress was, I admit, very limited. Thoughts of flamenco dancers, boleros and other ideas of traditional dress were the only images that came to mind. However, from the moment I entered the museum and began to look at the exhibits, I realized there was much more to Spanish dress than that. In fact, the museum’s permanent collection is arranged with an overview of the history of costume in Spain from as early as the 16th century right up to the 21st century. The purpose-built interior enjoys wide open spaces to move around comfortably and without the overuse of placards, displays appear to be less cluttered than in other museums. Although signage is limited, the use of interactive touch-screen terminals provides visitors with access to further information about a particular costume, designer, accessory, and so on. That said, although objects may appear better presented without labels, the terminals are a bit finicky and can be time-consuming to use. Space has been well organized and items are chronologically arranged, including, for example, a section on the Neoclassicism style resulting from the French Revolution and its effects on dress in 18th century Europe as a whole, and a display showing a typical 19th century Spanish domestic interior. An in-depth view inside some garments is offered; a corset for example, is shown in an x-ray image, allowing a closer examination of its construction. Another display features a partly-cut garment to reveal how the bustle’s construction was used to define the desired 19th century silhouette. Each display is a feast for the eyes and each direction offers the viewer one beautiful arrangement of costume after another. As the museum guides the visitor through its historical chronology, there is also an offshoot from the main trail, which leads to a section on regional dress. At once I recognized these clothes as fitting my original impression of typical Spanish costume. This exhibit, covering the late 19th to early 20th century, features items of dress and accessories which represent historical ceremonial dress, typical work clothes indicating specialist trades, and dress used in festival or traditional dance (in fact, the latter styles can still be seen in Spanish dance performances today). One example of dress that was particularly striking was from the region of Montehermoso, the north west province of Cáceres, Extremadura. The museum display shows a woman sitting in a chair with colourful, multi-layered underskirts, beautifully embroidered with motifs of birds, rosettes, carnations and other flowers. The woman also wears a particular gorra, a bonnet made from very colourful straw, adorned by ribbons, buttons and pompoms. The bonnet sits on top of a colourful kerchief, which is visible from a slight slit in the back of the bonnet. This flows downwards to cover the women to her shoulders. If worn traditionally, the bonnet would appear slightly tilted forward, a result of a type of regional hairstyle that has since been abandoned. The cuffs of her sleeves and her flat, ballet-style shoes are all richly embellished with embroidery. This elaborate use of embroidery also decorates the flamenco dancers’ manton de manila, the silk shawls and fans associated with Spanish culture and the typical matador’s costume. Approaching the end of the permanent gallery there is a section covering haute couture, and most importantly, Spain’s own contributions, including the work of couturiers Mariano Fortuny and Cristobal Balenciaga,both enormously important to the trade in their own right. Fortuny, an accomplished designer who invented innovative processes for dying and pleating silk fabrics, is featured. Also highlighted is Cristobal Balenciaga, regarded as the most influential Spanish couturier of the 20th century. Balenciaga, from the Basque Country, used Spanish culture, art, and religious dress as inspirationfor many of his evening gown and coat designs, such as the colourful, extravagant robes of cardinals in the Catholic Church. Balenciaga’s creations suggest the grand sweeping movements of a flamenco dancer or matador. The use of sashes, tassels, embroidery, boleros, brocades and hats throughout his collections reinterpret traditional Spanish culture for 20th century European fashion tastes. Moving on from haute couture are displays on the growth of Spanish ready-to-wear, marking the end of the museum’s historical journey. Looking back, it appears to me that the art and craft of embroidery indigenous to Spanish culture is a key signature feature of Spanish dress. The preference for materials of rich colour also undoubtedly creates a vibrant museum display. After being treated to such fashion profusion, don’t expect any ordinary ‘exit through the gift shop’ at Museo del Traje. Visitors here are invited to leave in style via their very own catwalk. With loud music pumping in the background, a walk on the red carpet awaits, surrounded by bright lights and your very own (simulated) audience. What more could you ask of a fashion museum? The catwalk front row: From left to right; Chaqueta y zapatos, Vivienne Westwood. 1985 – 1990; Vestido, Jean Paul Gaultier. ca. 1980; Capa, Roberto Capucci. ca. 1980. Photograph by Karen Scanlon. In the first of a short series of posts about Spanish visual and material culture, Amy-Lou Bishop, a first year student on the BA (hons) Museum and Heritage Studies degree course, reflects on a recent international study trip. As a guest of the University of Brighton’s BA (hons.) Design and Craft students, in February 2013, I found myself, along with seven other History of Art and Design students, on a study trip to Madrid. Having never been to Spain before, I was travelling with an open mind, with my expectations only informed by the Spanish imagery we all instantly recognise. Before we went we were told by our tutor to look out for the distinctive visual culture of Spain and try to identify what we think is their particular national cultural identity. We almost all had a ready check list of clichéd images of ‘Spanish-ness’: tapas and paella; matadors and bull fighting; flamenco dancers and their dresses, shoes and fans. We were told to look out for Moorish style and its legacy, and to see if there were any visible clues to Spain’s violent Civil War past. Being aware of Spain’s current economic crisis, there was a chance we’d see the effects of that on Spanish art, design and culture too. So by the time we got to Madrid, map in hand and intent on seeing anything and everything, we were directed to an ideal spot from which to see the city. When we got there, however, we found something I had in no way been expecting: an ancient Egyptian temple. Whole and complete, floating on a pool of water, it sits high above Madrid. As pleasantly surprisingly as it was to see, my main question was: why was it there? There was surprisingly little information provided at the monument, as if the locals were so used to it or it was so taken for granted that they didn’t need this anomaly on the landscape to be explained. 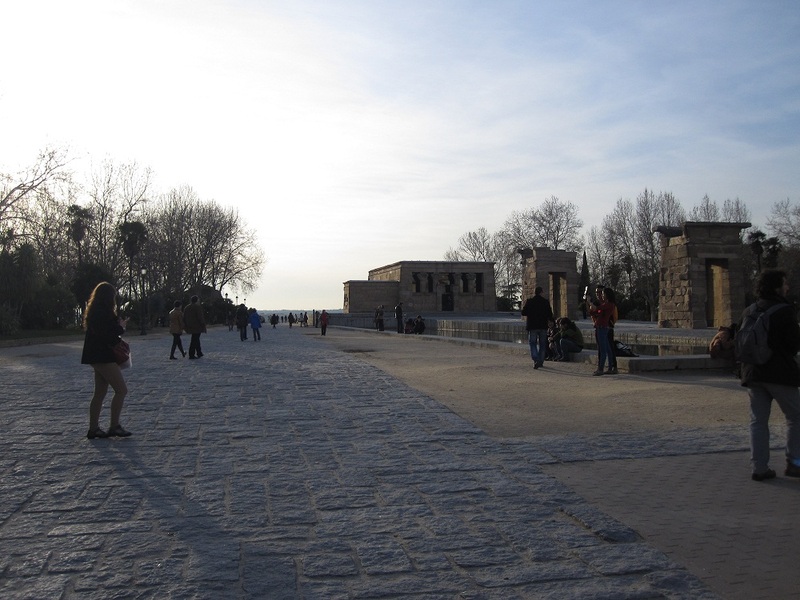 Since getting back, however, I have found out that it is called Templo de Debod. After standing on the banks of the Nile for two millennia, it was relocated from Egypt in 1968 to thank Spain for their assistance in saving ancient temples from flooding during the dam building of the period. 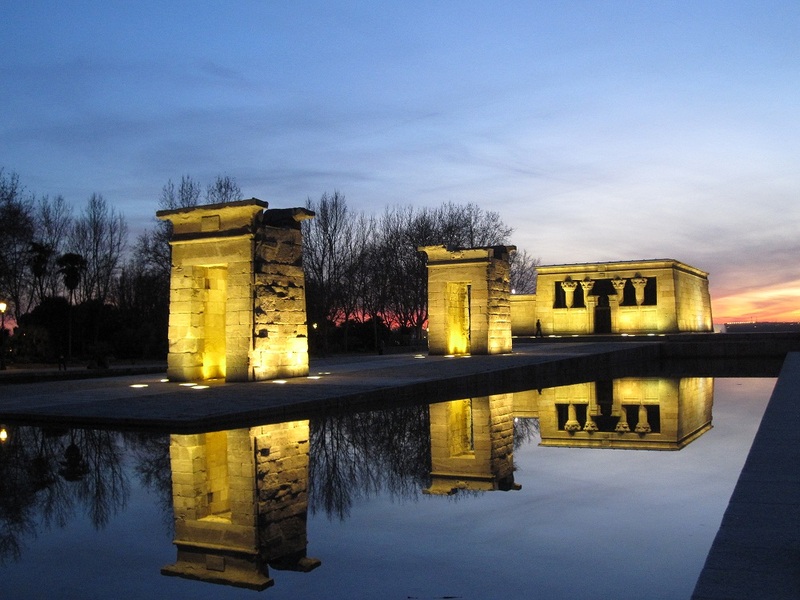 Along with another temple, sent to New York City, Templo de Debod was given to Spain and placed in the Parque Oeste near the royal palace in Madrid. We visited the spot on two separate occasions and were surprised each time by the amount of people there. However, they were not in the park to see the unusual landmark. They were all gathering for the view behind it – the uninterrupted landscape and the ideal spot to view the sunset. Vast numbers of visitors come and turn their back on the monument, and instead pose in front of and photograph the brilliant, dramatic hues of the setting sun. It would not be an exaggeration to suggest that everyone has seen a sunset, and perhaps almost all of those will also have photographed one. The sunset in Madrid seems particularly spectacular, at least compared to ones in England, and I found myself in the same position as all the other visitors, taking pictures of something I’d seen hundreds or even thousands of times before. Of course, by doing this we were all guilty of the same thing – ignoring the temple. When the sun sets, you might expect the temple to regain some attention, but with the sun gone the people start to leave too, as if there is nothing left to hold them there. Obviously not everyone ignores it; I am proof that they don’t. I think, on balance, I took more photographs of the temple than of the sunset, but I can say that on those two occasions I was almost the only one. There were others there using the space as they would any open space. There were families strolling, skateboarders passing, people just sitting on the water edge, even a man entertaining children by blowing giant bubbles; but for them it seemed that the temple wasn’t adding anything to their activities. Despite its ancient origins, sacred status and unusual location, thousands of miles from home, I could have been in any park and the scene would have looked exactly the same. I wonder how the temple is viewed by the local madrilenos. Do they find it odd that a piece of Egypt is located slap bang in the centre of their city? Does everybody who visits find it as unusual as I did? Or do they just take it for granted as an added extra to their sunset snapshots? However it is seen, I felt it added something to my trip. And maybe, in a roundabout way, it helps to answer what Spanish national identity is: it can be a bit of everything, even a little bit of Egypt.